Mobile banking is now integral part of banking and more people are getting on board. So we will be taking a look on how you can download and Use the Access Bank mobile app for your day to day transactions. That is if you are an access account holder which will inevitably reduce the time spent in the banking premises. The access bank mobile app contains a lot of features and more features are being added with each new upgrade. All access bank holders can have real time access to their accounts and the funds in it using the app. The app cost nothing to setup and is very easy to use. However, if you are a first timer, you will have to visit the nearest Access Bank branch and fill a Form. In order to get an authentication PIN which is needed to be able to transact in the app. The PIN will be a four digit PIN which cannot be used unless you change it to your Preferred PIN in the Settings of The App. The Access Bank Mobile App has a pretty nice UI and it supports both facial recognition and Fingerprint authentication for optimal security. You can also choose to use the usual password if you wish. ⚫ Contact Your Account Officer With Just A Tap and a lot more. Download the Access Bank Plc App For iOS. Alternatively, You can head on to your respective stores and search for “Access Bank Plc” and Download The App. ⚫ Launch The Access Mobile Banking App. ⚫ Fill the in-app form and Verify Your Account. ⚫ You should get a success message. That is it. You just transacted using the access mobile app. Note: if you have already gotten your PIN before, then you can use it. If not, kindly go to the nearest Access Bank Branch to fill the required form and obtain one. 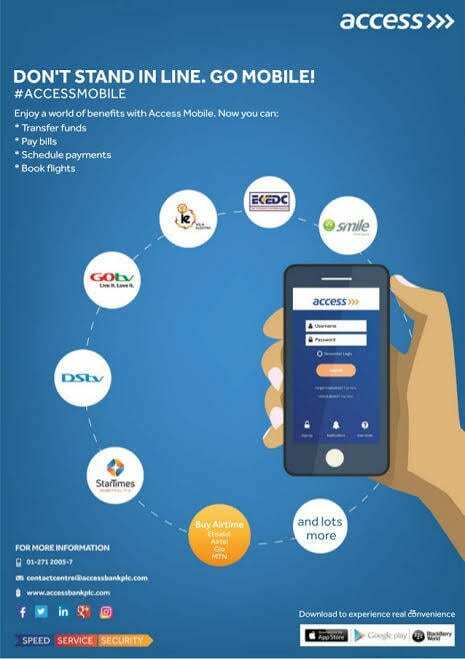 The access bank mobile app is a must have for all access account holders. They should also know not just how to download but also use the access mobile bank app. From the app, a lot can be done from the comfort of your home. No need to visit the bank to transfer money or walk to the nearest airtime vendor just to buy airtime. Just sit back, relax, Log on to your access bank mobile app and do all that in just a few clicks.